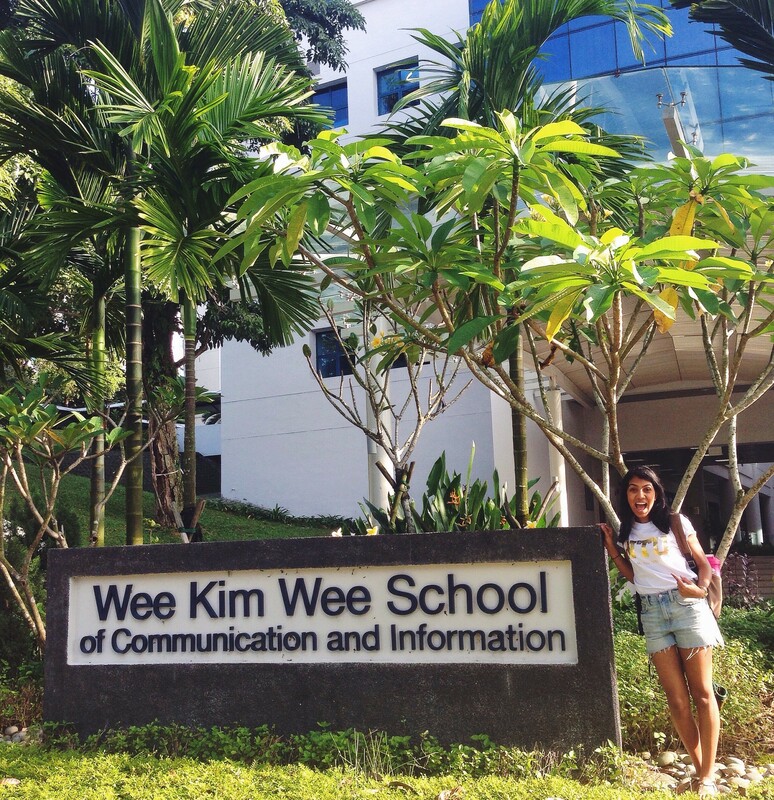 5 weeks ago today I arrived in Singapore… NOT REAL! I apologize for not being able to update you guys sooner but things have been super busy here in terms of settling in, school and everything in between. But there’s lots of updates for you, so get ready! Things have gotten much better since and I think it was just a matter of settling and getting accustomed to the small differences in Singapore. Being 13 hours ahead, it takes some time to organize the best times to Skype or talk to friends and family from back home, but it’s really just a matter of me waking up earlier or going to bed a little later, which I don’t really mind! I also met my roommate, Aliah, and I AM THE LUCKIEST PERSON IN THE WORLD! She is such a sweetheart and we instantly clicked with each other. Also, she invited me to her cousin’s wedding in April!!!!! My excitement to attend a Singaporean wedding cannot be contained, so I’m really looking forward to that. Oh P.S., last time, I talked about the amount of stairs I had to climb to get up to the top (which was 92). But just to put it all in perspective, I took a quick time-lapse video to show you what I mean. Living in residence in Singapore, you end up buying most of your food because the kitchen facilities are pretty limited. I really had no complaints during the first few weeks because food here is CHEAP. And when I say cheap, I mean like it’s a Torontonian’s dream, because it’s delicious, good quality and easy on the wallet. For example, you can probably get a full-sized meal for anywhere between $2-$5 on campus! Supposedly, the government in Singapore has partially subsidized the food costs for students, so eating on campus, you know your meals are bound to be cheaper. 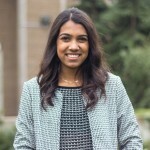 I’ve also eaten outside of the campus borders, and while food is a little more expensive, I have yet to pay more than $10 for a meal! But I still do miss cooking my own food, only because I love, and I mean LOVE to cook and experiment with new foods (and I do love my healthy foods too). I especially miss making breakfasts! Back home, I would classify my food tastes as adventurous but also quite healthy. So a typical breakfast for me would alternate between protein pancakes, avocado toast and eggs, and oatmeal. So I ended up buying a giant container of quick oats here, and every morning before class, I’ll whip together a bowl of oatmeal with cinnamon, banana, egg whites, coconut flakes and cacao nibs. But in all honesty, having the same breakfast every day gets kind of boring 🙁 So one day, I decided to be really ambitious and get ingredients to make protein pancakes. It was a mission and a half to prepare and cook them, but the final result was…. 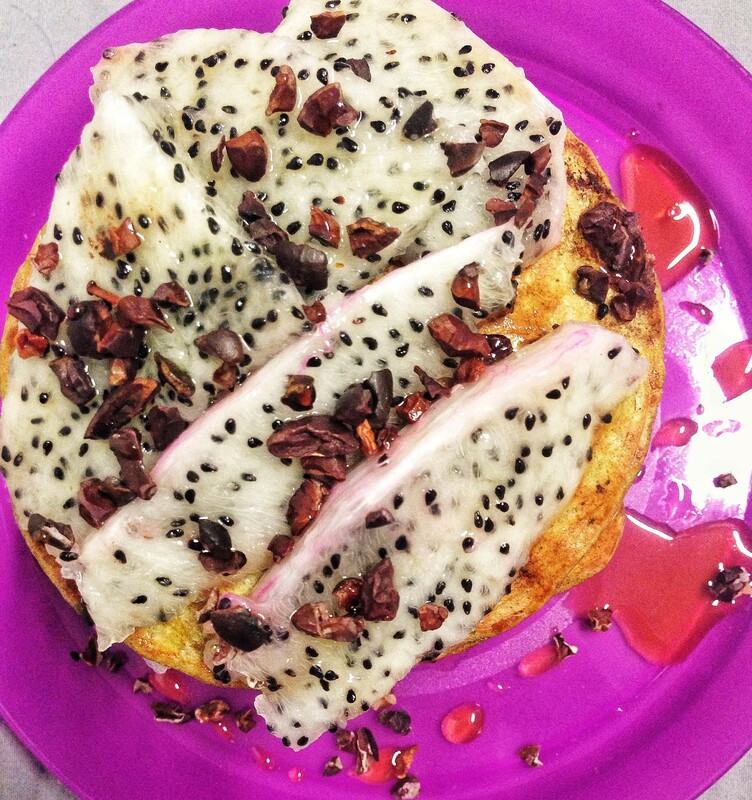 HONEY MATCHA DRAGON FRUIT PROTEIN PANCAKES!! It was like a breakfast from heaven. 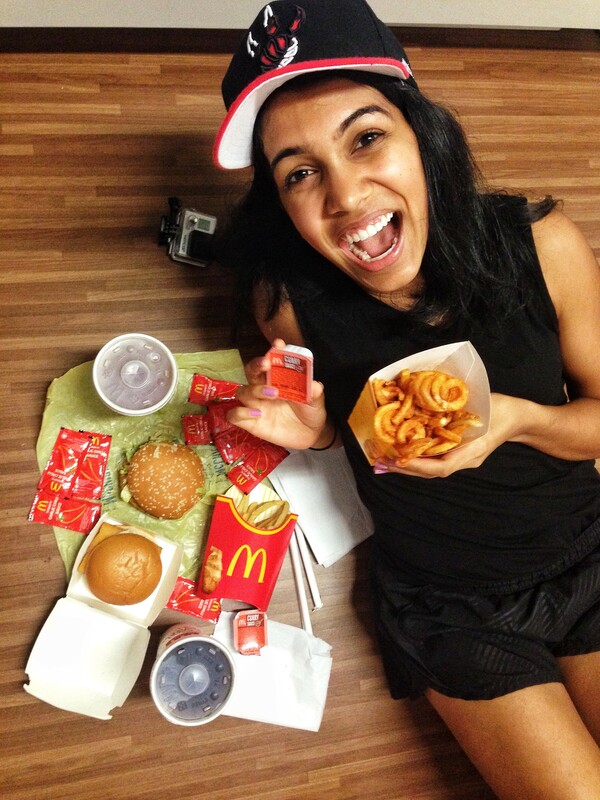 2 AM McDonald’s Delivery ahhh!!! But, being adventurous, I’m still always up to try the unique foods here. The classic Singaporean breakfast consists of half-boiled eggs, which you crack into a bowl and it has a soup-like consistency, and 2 slices of toast with butter and a jam called “Kaya.” Kaya is a jam made from coconuts and eggs and MAN OH MAN it’s delicious! (I’m also obsessed with Coconut anything so this was like a dream.) There’s a food stand in one of the Canteen’s (which is the term for cafeteria here) with a man who serves fresh waffles and one of the things you can get is Kaya on the hot waffle. I think I ate 3 in a row one night while taking a study break… (Healthy me was not impressed and thinks I need a bit more self-control) BUT IT WAS SO WORTH IT! Definitely buying at least one jar of Kaya to take back home. This is a meal called Thunder Tea Bee Hoon. 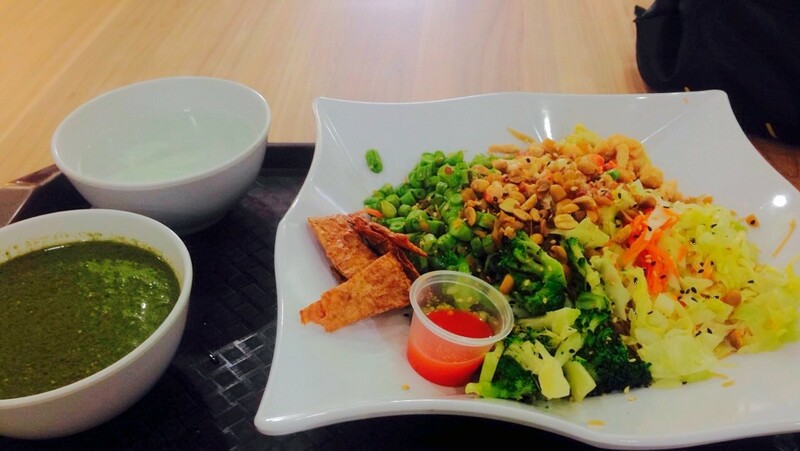 It’s a vegetarian meal with loads of veggies, mock meat, peanuts and sesame with a type of noodle called Bee Hoon that has lots of fibre . The green soup-like stuff is actually a “sauce” that you pour over top of and it’s actually made from green tea, herbs and almonds. SO. DELICIOUS. The campus here at NTU is massive. And we’re talking, 3 times the size of Western or Queens… So you can imagine being a Ryerson student how much of an adjustment the campus is. They do have free on-campus buses that run throughout the day to take you to your classes. So every time I have class, I catch the bus from across my residence to my school building. It takes about 20 minutes, which is much better than the 45 minute walk I would have to do, so no complaints whatsoever! 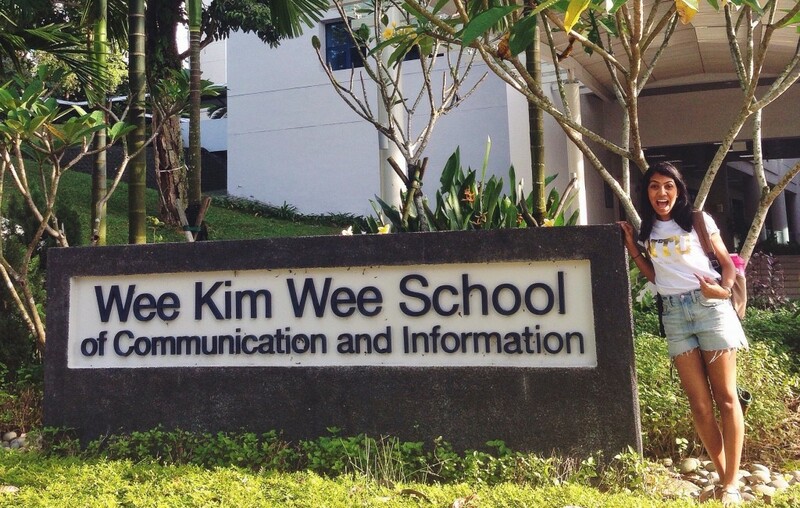 My school faculty is called the “Wee Kim Wee School of Communications” and the building is BEAU-TI-FUL. Super modern and the spirit is always so upbeat. I’ve met a lot of local Singaporeans in my classes who are all so kind and welcoming, and so far, I love all my classes. I’m taking a “persuasive speaking” class, a “magazine design” class, “acting & directing for film/TV” class and for fun, I decided to take a dance class called “DanceSport” (it’s like a mix of Samba, ChaCha, Waltz and other line dances). I feel like I’ll be learning a lot because these classes are unique, so that’s definitely an added bonus. Hanging out in front of my school on the first day. 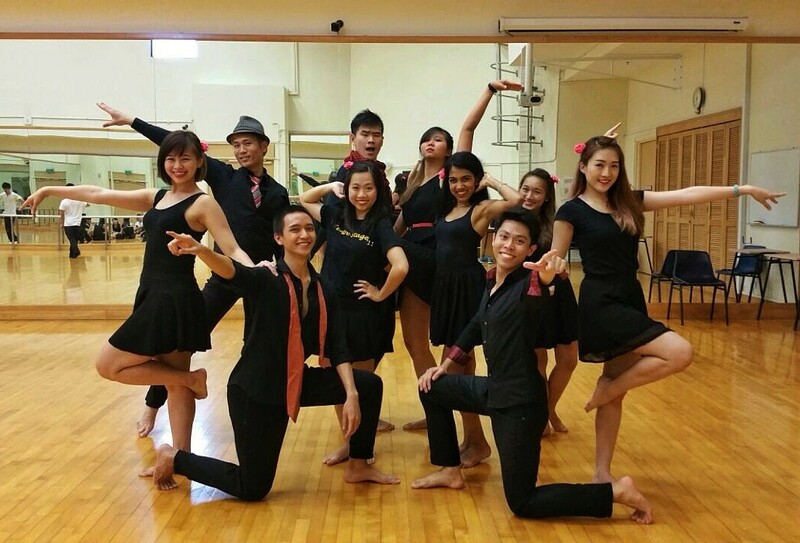 My Samba Choreography group for our first assignment. One thing I notice a lot about NTU is that the school spirit is unreal. Everyone is involved in some sort of activity or sport, and there are so many opportunities to get involved. Every Hall of Residence has a sports team for almost every sport imaginable (But no ice hockey, they left that for us Canadians to handle haha). They compete in this huge Hall Olympic Games which happens from December-February! Sadly I wasn’t allowed to join any teams because I arrived too late into the semester. But I did end up bumping into my Hall’s soccer team and they let me play some pick-up soccer with them, which is awesome! So every week I join them and play for fun, which brings back great memories because I grew up playing soccer for most of my life. 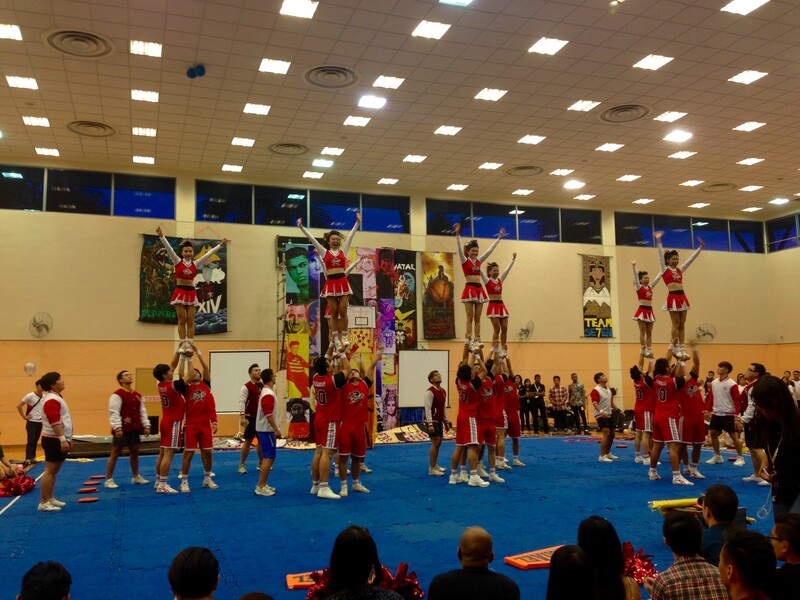 I also got to watch the Inter Hall Cheerleading Competition yesterday. SO COOL. I’ve watched our Hall’s team practice since I arrived and it was amazing to see it all in action. We’ve been the champions for the past two years, but this year, we ended up placing 2nd. Regardless, I was so proud of them and it was a school spirit experience I’ll never forget! Hall 10 Cheerleaders did a Michael Jordan themed cheer… really cool!